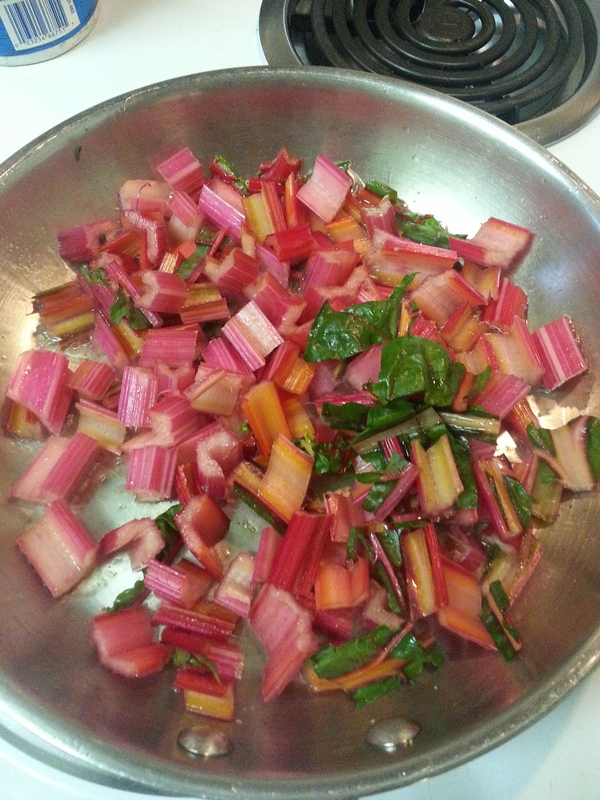 We picked up some really nice looking Swiss chard at the farmers market from Get Fresh Produce (Everything grown with Aquaponics). 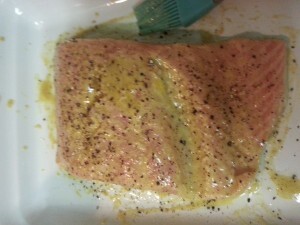 We already had a package of wild-caught Salmon from the Fresh Market. Keith decided to cook it all up, yay me! 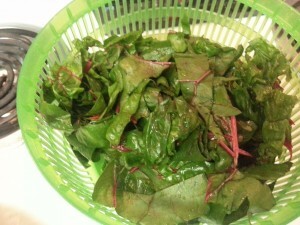 First he washed and chopped the chard, chopping the stems up and separating them from the leaves. 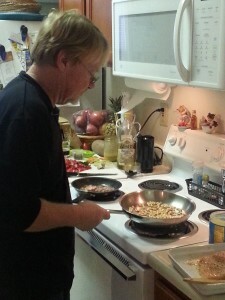 He tossed the stems in a pan and added a TB of Ghee and sauteed them up until they started to get soft (~8-10 minutes). Then added 2 cloves chopped garlic and sauteed a bit longer, then he splashed in some red wine and covered it for a few minutes to soften the stems a bit more. In the meantime he cooked up some fresh jowl bacon in a small skillet. 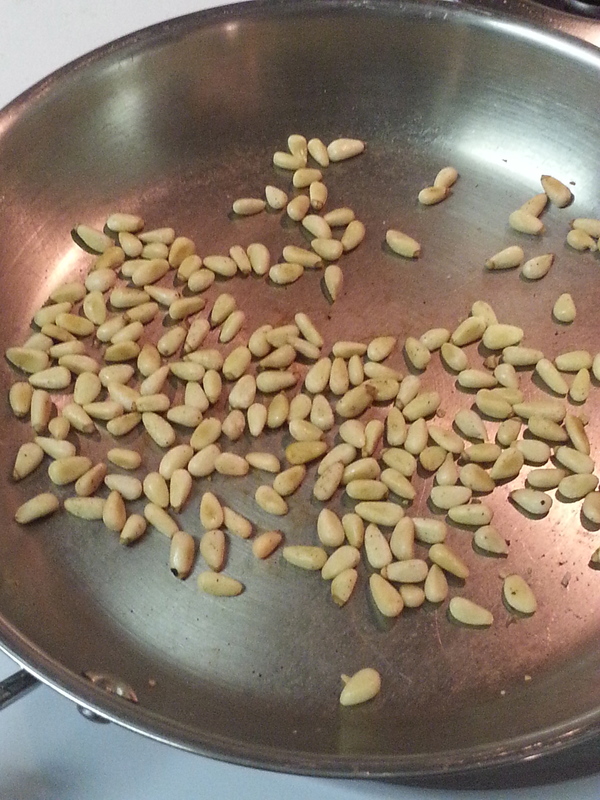 Then toasted some pine nuts. Next, he added the ribbon cut leaves. (roll the leaves and cut them in ribbons). He put a few pinches of salt in the leaves and put them in the pan with the stalks and then added some chopped bacon with a splash of bacon grease and the pine nuts along with some re-constituted dehydrated apricots with the juice which was approximately 1/2 C. (you could use cranberries or any dehydrated fruit). Heat your oven to 350 and cook skin side down. Cook for 10 minutes and apply more of the mustard dressing. Cook 10 more minutes and then turn the oven on broil and cook until the top of the Salmon has a nice caramelized glaze on top. 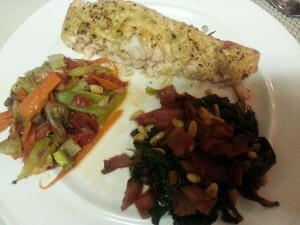 The recipe for the Swiss chard was adapted from Nom Nom Paleo’s recipe. 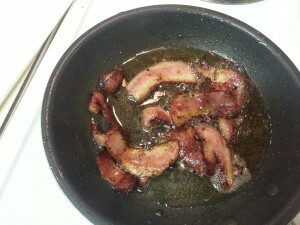 Combining 1 tsp salt, 1 tsp pepper, 1/8 cup spicy dijon mustard of your choice, and some vinegar to taste. Combine all ingredients and shake in a jar. The other side dish that you see is an Italian vegetable combinations called “Mirepoix” or “Soffritto.” We will put that in another post, as it has many uses besides eating as a side. 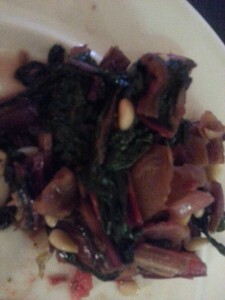 Here is a recipe that talks about it: Sofritto. We hope that you enjoy this recipe. If anything is unclear send us a message and we will try to respond!